Connect a non-B&O amplifier or receiver to your Bang and Olufsen music system or BeoVision TV using the Powerlink speaker outputs. This cable converts Powerlink to industry-standard Twin Phono / Stereo RCA plugs - hence it is one of our most popular products! We are particularly proud of this cable - which we consider to be a very neat solution to let you integrate your B&O system into a conventional hifi or home cinema installation, whilst keeping control at your fingertips with your B&O remote. Many Bang and Olufsen dealers will tell you that this can't be done - but we can prove them wrong! You will be able to use your B&O system or B&O remote control to control the level of the attached hifi loudspeakers (just leave the volume on the non-B&O amplifier set at or near to its maximum level). 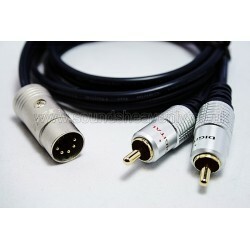 A variant of this cable also allows you to plug directly into a powered (active) subwoofer! See our "Powerlink compatible to Subwoofer" cable for more details.